As the scientific community continues to recognize the need for more movement during the day, standing desk solutions are increasing in market popularity. 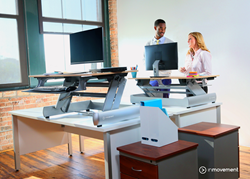 InMovement® has been recognized with the 2015 GOOD DESIGN™ award for the Elevate DeskTop DT2 Standing Desk. Each year, the Chicago Athenaeum Museum of Architecture and Design presents GOOD DESIGN Awards to the most innovative and cutting-edge industrial, product, and graphic designs produced around the world. Recognized in the furniture category, the InMovement Standing Desk was awarded for its distinguished aesthetic and quality design. InMovement Standing Desks are a cost effective retrofit solution for individuals wanting the freedom to switch between sitting and standing throughout the workday. The DT2 model comes fully assembled and can be placed atop an existing workstation, turning almost any surface into a sit-to-stand desk. The InMovement Standing Desk DT2 features a sleek silver base and choice of a dark wood, light wood or modern white desktop finish. Since 1950, the Chicago Athenaeum has recognized designers and manufactures in fifty different countries for their accomplishment in contemporary design. Over the past 65 years, thousands of companies have been recognized, ranging from Apple, Inc. to Audi AG. ; Boeing Company to PepsiCo Inc.